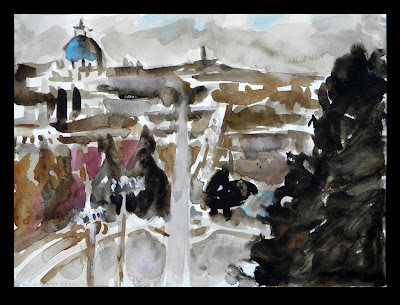 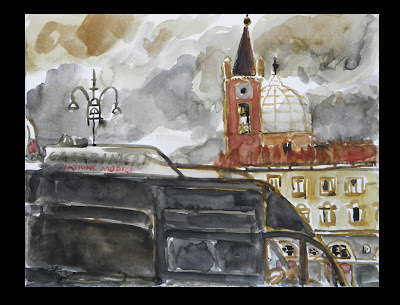 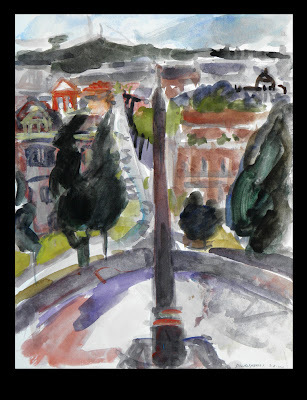 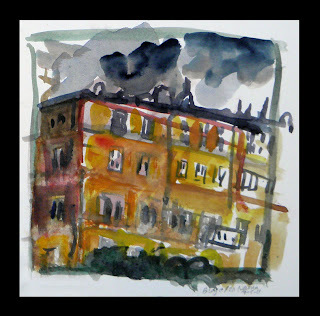 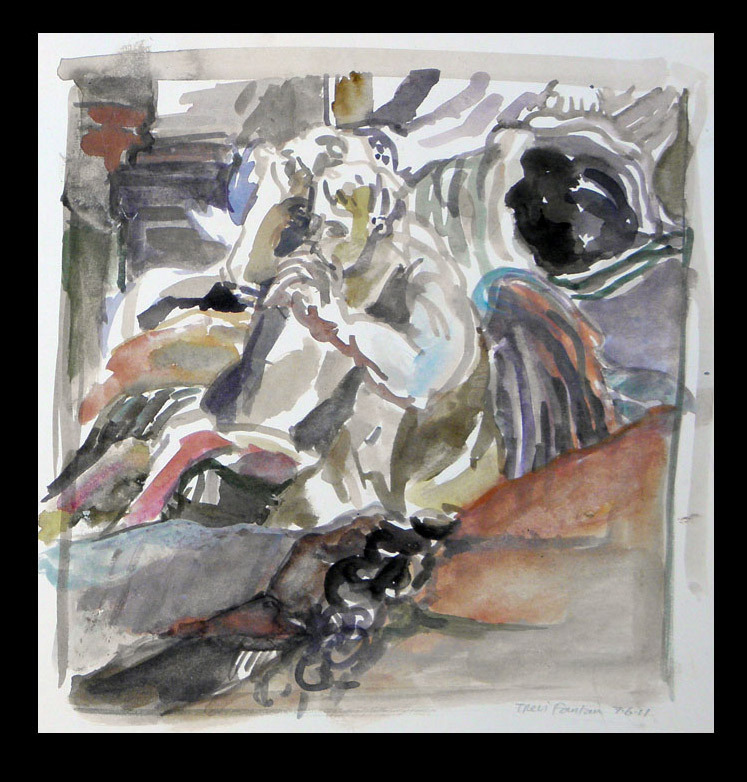 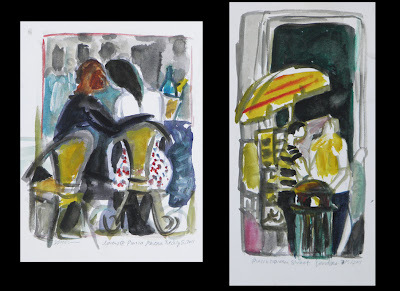 Watercolors from the Rome Art Program with Carole Robb. On weekdays, we painted in the morning and drew in the afternoon. Occasionally, we painted in the evening, when the crowds gathered and the light intensified. When Carole wasn't instructing, we learned from Clint, who studies at L'Academia delle Belle Arte in Rome. All pieces are all on Stonehenge watercolor paper. Enjoy! 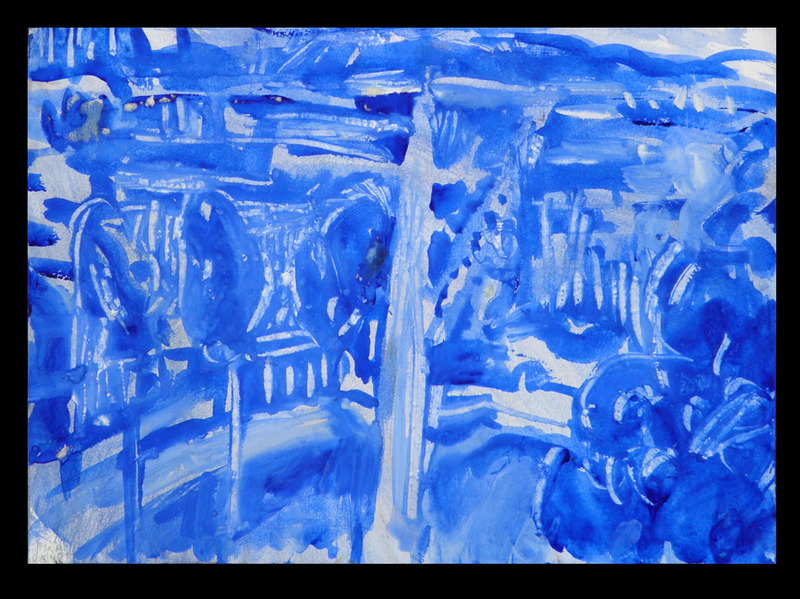 We practiced painting from memory and tackling different perspectives. 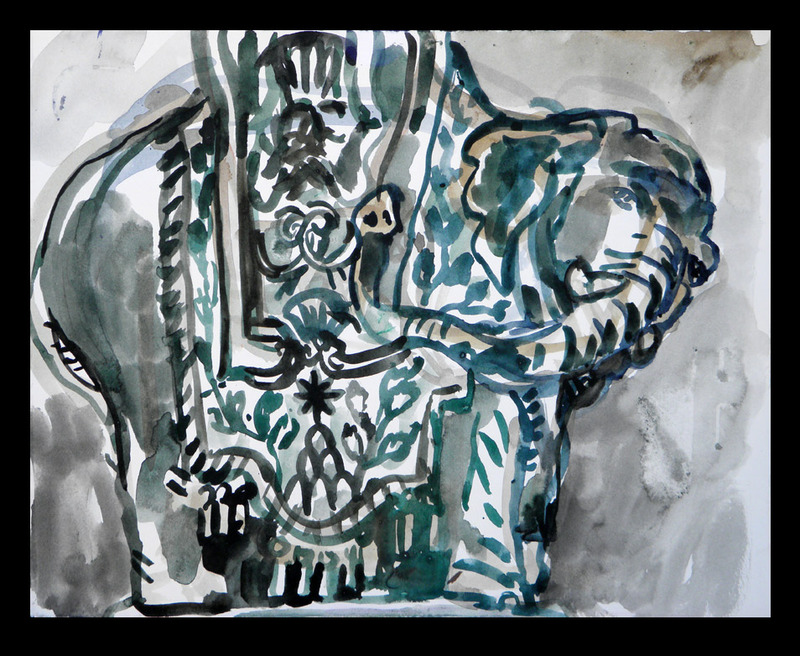 Pantheon from Memory 13" x 10"
Bernini's Elefante: Side View 10" x 13"
Bernini's Elefante: Back View 13" x 10"
The assignment was to focus on the sky, but I went off on my own and didn't hear the assignment. 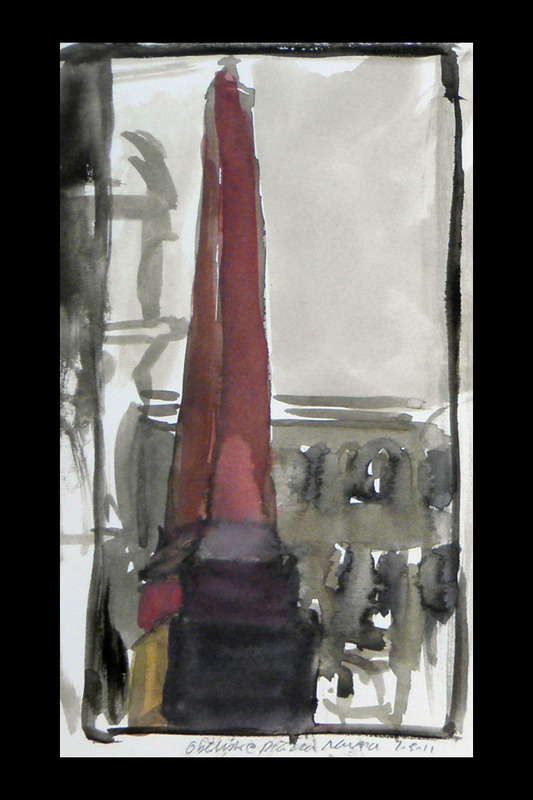 So, I focused on the crowds and the interesting shapes created by the buildings and statues. 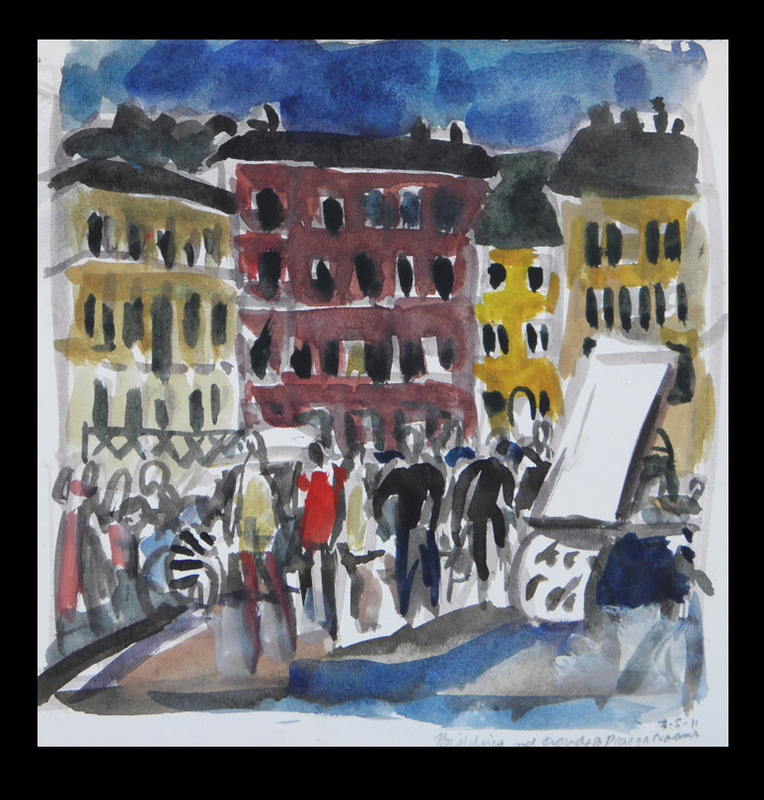 Early Evening: The obelisk and buildings at Piazza Navona, each 8" x 4"
Bernini's Statue on the fontana 6" x 4"
Building at Piazza Navona 6" x 6"
Statue of a man covering his face 4" x 4"
Piazza Navona at night: vendors, artists, tourists, restaurants...7" x 7"
Lovers and Vendors at Piazza Navona 10" x 13"
With Clint as our instructor, we set out to conquer two powerful icons of Rome: the Fontana di Trevi and the Spanish Steps. 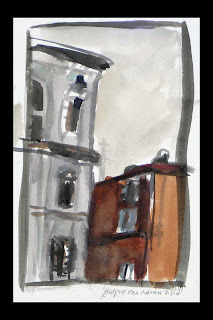 Clint was a wonderful guide, encouraging us not to feel overwhelmed by the landmarks. 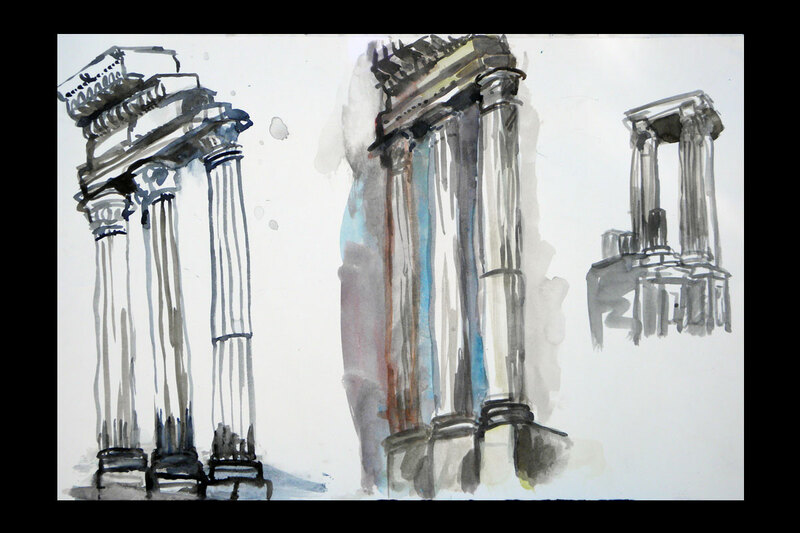 We did several quick studies of each place, making a concerted effort to stay fresh throughout the process. 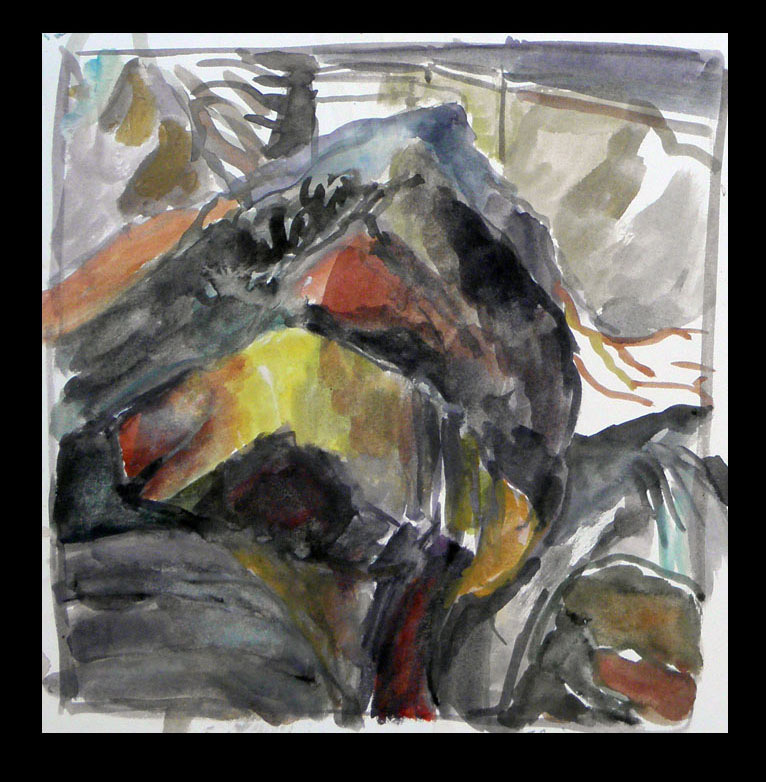 Bernini's Statue of the Fontana di Trevi 9" x 9"
Rock formation of the Fontana di Trevi 9" x 9"
I made this quickly before drawing class one day at the Piazza del Popolo. 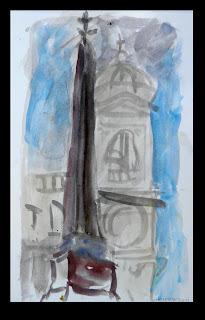 We spent a lot of time drawing and painting at this particular piazza. Piazza del Popolo 10" x 13"
We painted the Piazza del Popolo from the Pincio, which is a courtyard connected to the gardens of the Villa Borgese, which overlooks the entire city. 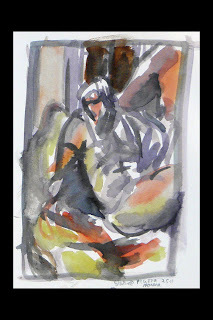 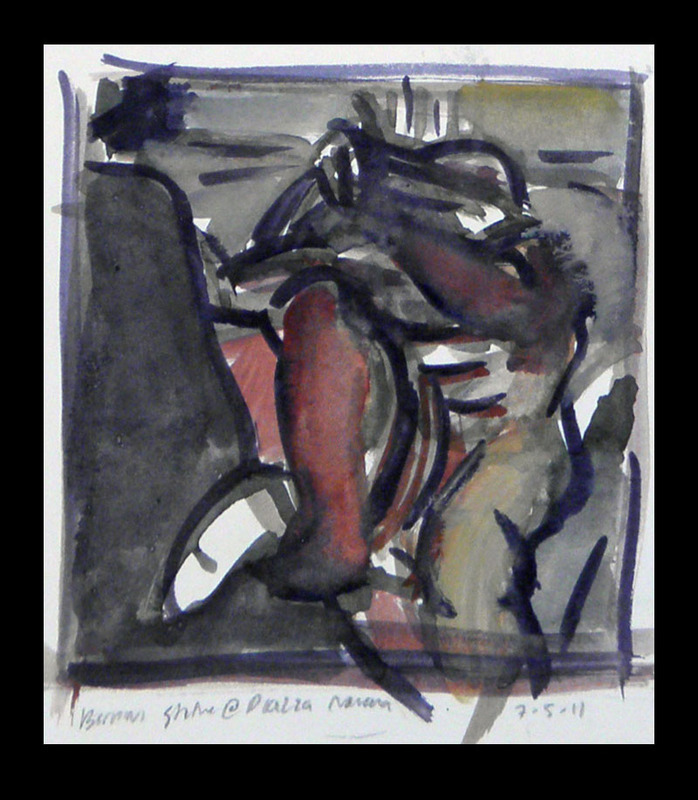 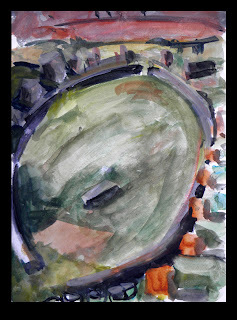 We started with tonal paintings, and then painted several quick studies as the light changed. 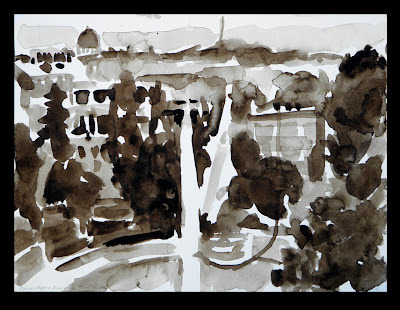 Soon it was dark...and the paintings became naturally tonal again. 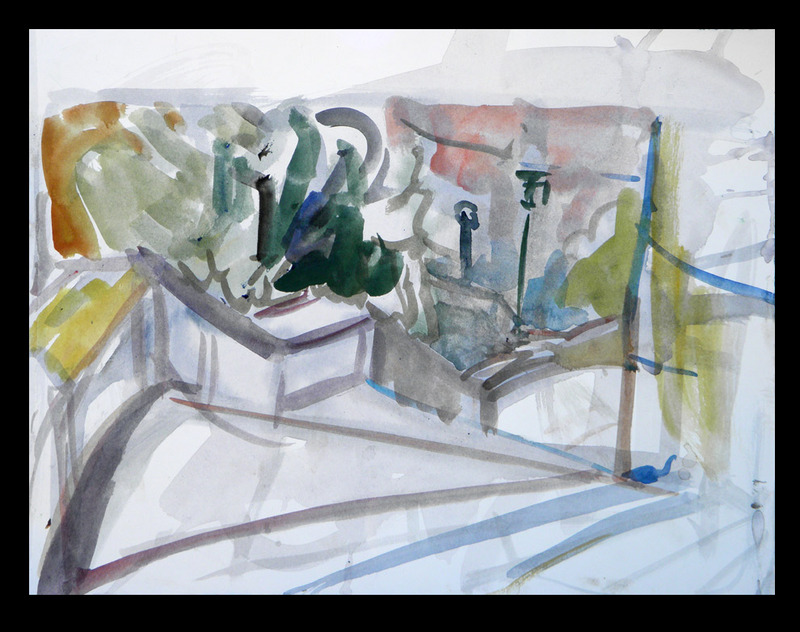 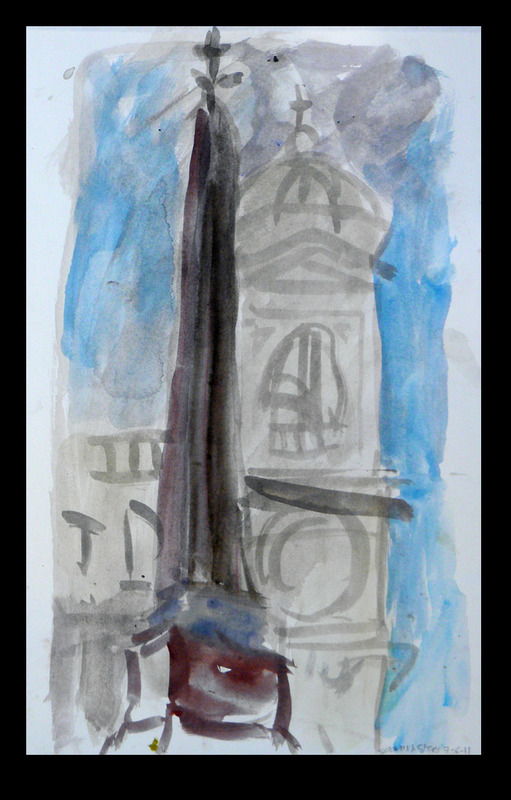 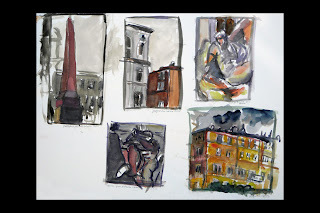 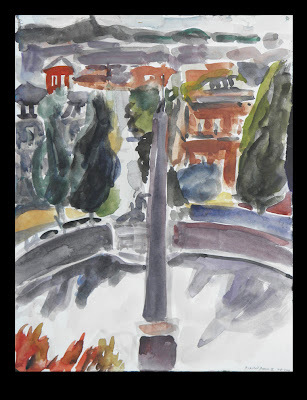 Each is 9" x 12"
We did several studies of the Piazza del Popolo in the daytime...there was so much to see. 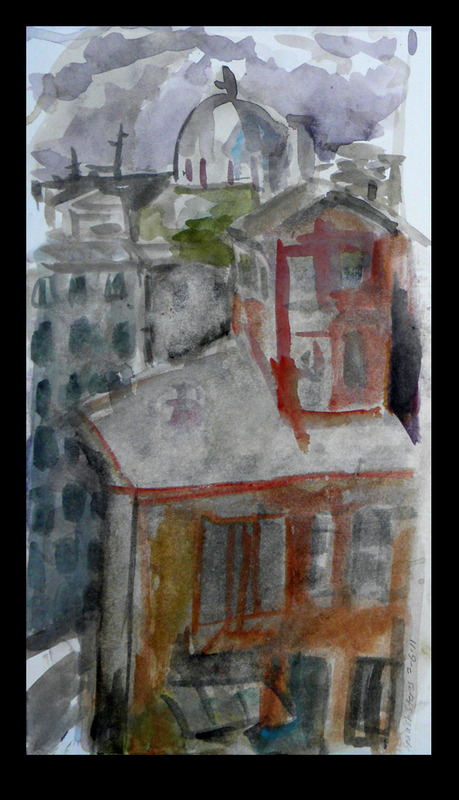 After a few renditions, it became easier to simplify the view and block out large colors and shapes. 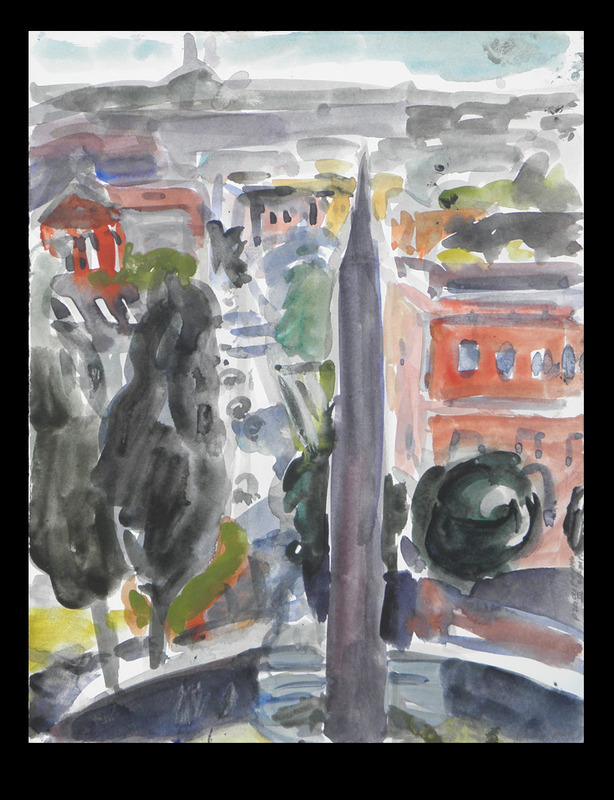 Each is 9" x 12"
Our last day of painting, we went to the Roman Forum with Clint. It was again overwhelming to paint such beautiful forms, which are so often reproduced in books and photographs. 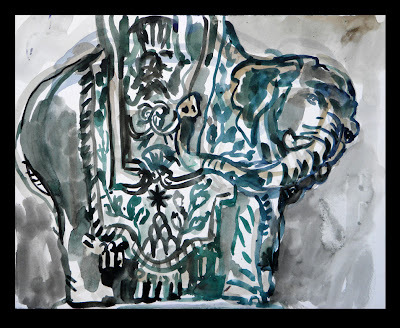 I only did one painting of the columns, but several more drawings (to be shown in another blog entry). 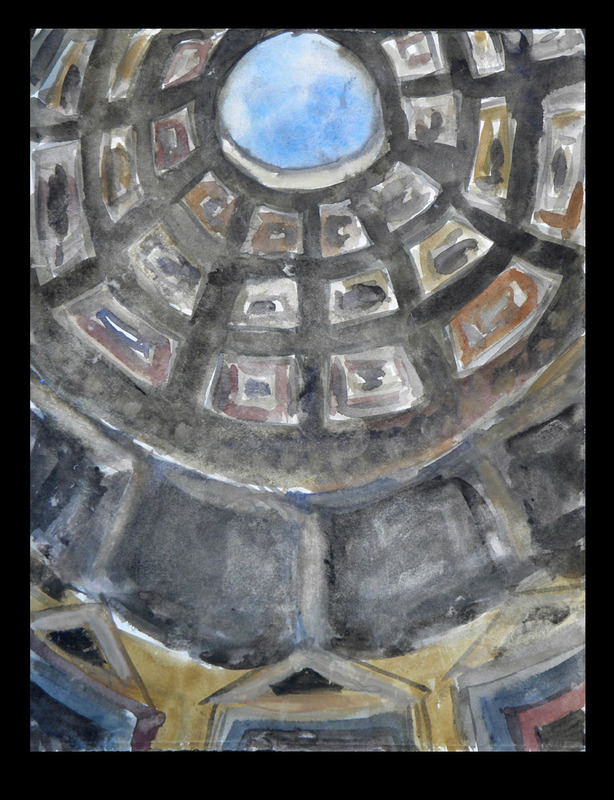 I also did a sketch of Nero's private Circo on the Palatine. 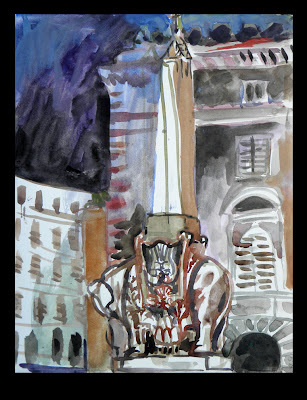 Columns at the Foro Romano 13" x 20"
The Emperor's Private Circus 12" x 9"